90% of the time, startups fail due to self-destruction and not due to competition. 10% of startups that do succeed go through several near death experience. Goes to show that we are yet to master the art of creating scalable and sustainable startups. Startups fail to synchronise their five core dimensions – Customer, product, team, business model, and financials. Most of the failures are the results of one or more of these dimensions falling out of sync with the others. 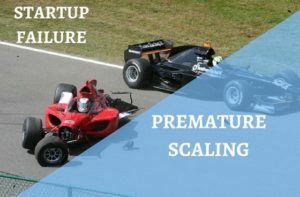 The most fundamental and common reason behind lukewarm startup performance and failure is “premature scaling” of these core dimensions. The same report, based on data from over 3,200 high-growth tech startups, also states that 70% of startups scale prematurely. What are the Top Premature Scaling Characteristics? Startups can prematurely scale their fund raising, their team, their markets, customer acquisition strategies, over build their products, so on and so forth. This table provides explanations on the 5 key core dimensions of premature scaling that is the number one reason for startup failure. Core Dimensions. Premature Scaling Characteristics. Huge spending on customer acquisition strategy much before a product / market fit analysis and a strong lock on the market. Trying to override the absent product / market fit by focusing on sustained marketing spending without established metrics. Spending in poor performing acquisition channels. Building a product that does not offer a solution. Invest in a product before product / market fit analysis. Incorporating too many features from day 1. Start with the basics and when they work to add on others. Hiring too many employees too soon, and on high salaries, before a strong cash-flow is available to meet the overheads. Acting on the premise that a growing team means a successful company. Hiring specialists much before they are needed. Adding too much to management overhead. Hiring top / middle level managers than necessary instead of the actual doer. Focusing too much on profits in early stages. Chasing to increase revenue while decreasing profits. Raising too much funding too soon make for an undisciplined startup. Gives startups the room to prematurely scale the other 4 dimensions. Given below, in brief, are two classic cases of premature scaling. The statement given to Tech In Asia by Navneet Singh, CEO and founder of Pepper Tap, puts what went wrong in a nutshell: “We operated on a negative margin per delivery and in such a situation the path to profitability looked very distant”. Housing.com: Rahul Yadav, founder and former CEO of this real estate listing website, on what went wrong: “We scaled up too fast. We should have cracked one market completely before venturing out into any other market. If I were to look at Housing again, I would rather crack the model locally and keep refining it before taking it anywhere else in the country. I would scale up for profitability than for burning”. – Quartz. The Present – Focus on Sustainability. Investors too have found a new wariness and have changed their focus from backing ventures with just high valuation and no real return to ventures which sustain in the long run. With the coffers beginning to run dry, thanks to the new found wariness among Investors, the era of unchecked growth seems to have leveled out. Quoting Rishabh Lawania, founder of startup tracker Xeler8: “Since 2015, as many as 1503 startups have closed down in India. Angel Investors and early stage VCs have burned their fingers far too many times, but not anymore. They have mastered the art of due diligence and are making quick and informed decisions now”. Forbes. India continues to be the 3rd biggest startup ecosystem in the world, supported by many fresh initiatives from the Government and private players. But we need to learn from the past, learn from the startups that have gone bust. It is now time for us to focus on sustainability, because once a sustainable business model is in place, everything else, including scalability, will follow in its wake. Moving forward, only value-driven sustainable business models, with a healthy respect for their bottom line and delivering real returns, will be able to scale successfully, rather than the valuation-driven startups.